With ground beef, potatoes, and tomato soup. POur 2 cans of vegetarian (alphabet soup) soup and 2 soup cans of water over the hamburger and vegetables. Bake for 1-1/2 hours at 350 deg. Can be kept warm in the oven for some time if everyone can not be served at the same time. 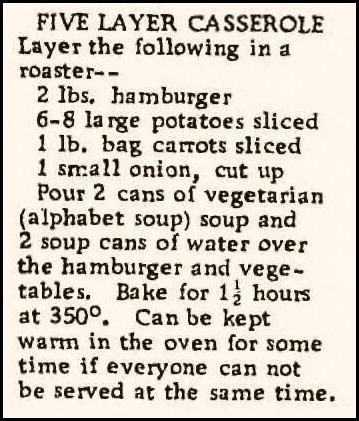 Place a layer a of meat, layer of potatoes, onion, and celery in a 2-quart casserole. Salt and pepper to taste and pour half the can of soup over all. 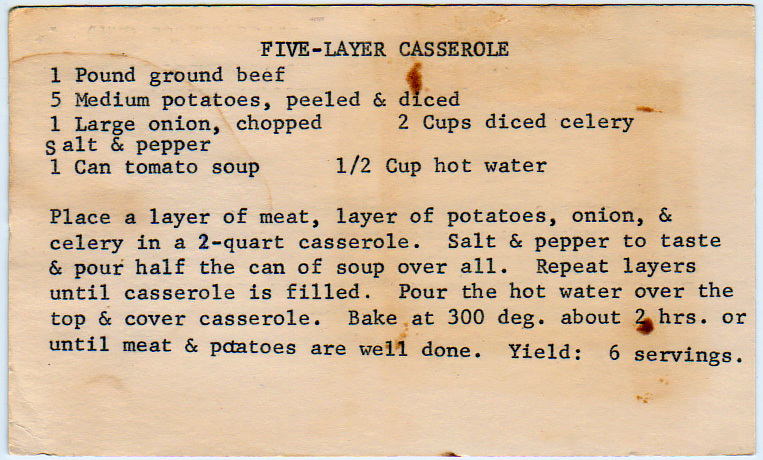 Repeat layers until casserole is filled. Pour the hot water over the top and cover casserole. Bake at 300 degrees about 2 hours or until meat and potatoes are well done. Because who doesn’t love a tomato wedge in their taco? I believe she means Old El Paso.